I love using coconut oil to make Chocolate Covered Banana Freezer Bites and Sweet Potato, Sausage and Spinach Hash, but there are some great ways that you can substitute coconut oil for other fats in your baking too. 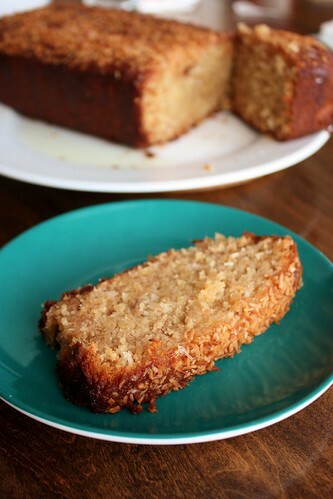 Instead of using butter for this banana bread recipe, I used coconut oil. 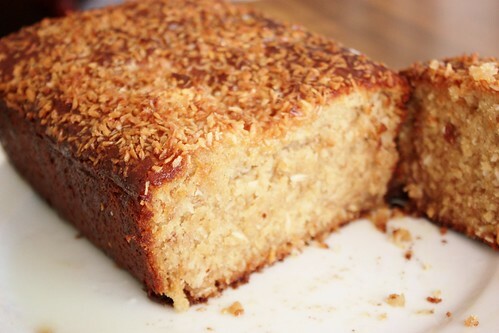 The result was a super moist bread with a light coconut taste. 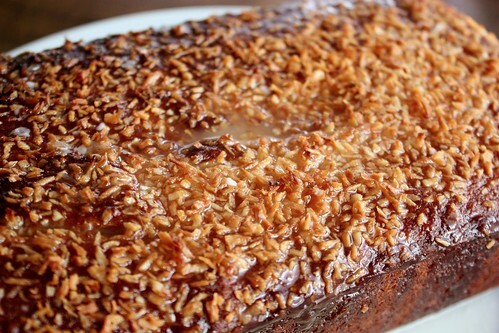 Combined with a coconut crust and a lime glaze, you have a great tropical treat. The lovely tropical flavour from the coconut, bananas and lime helped me forget that I’m in the middle of a Canadian winter, and not somewhere near the Caribbean. Preheat oven to 350ºF. 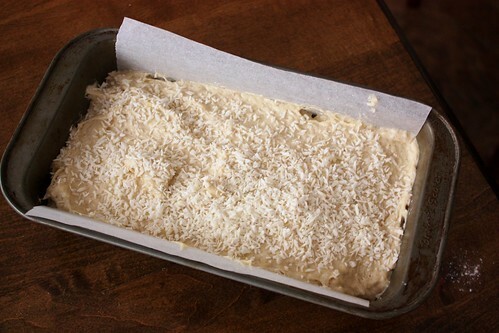 Line a loaf pan, with parchment paper. Combine flour, cinnamon, spices, baking soda, baking powder and salt together in a large mixing bowl. Set aside. 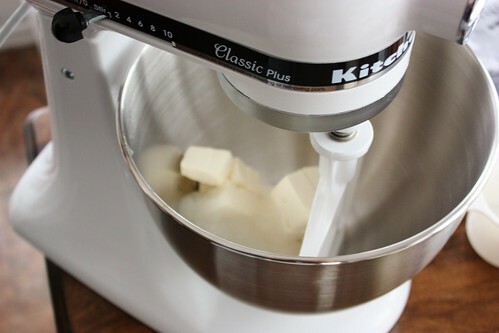 In a mixing bowl, cream together coconut oil and cream cheese. 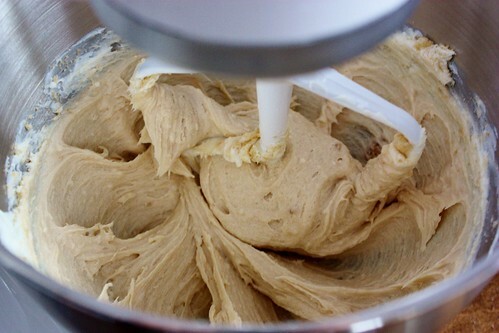 Add in brown sugar, and mix at medium speed, until fluffy, about 5 minutes. Add the egg and bananas, mix until combined. Add the dry ingredients and mix on medium speed, until just moistened. 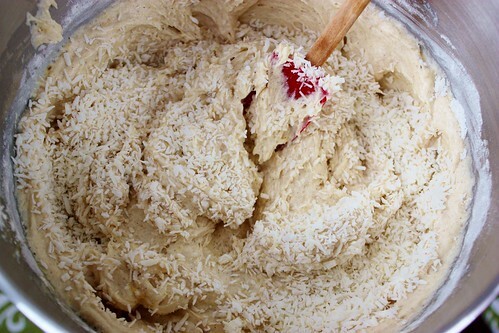 Stir in coconut flakes. 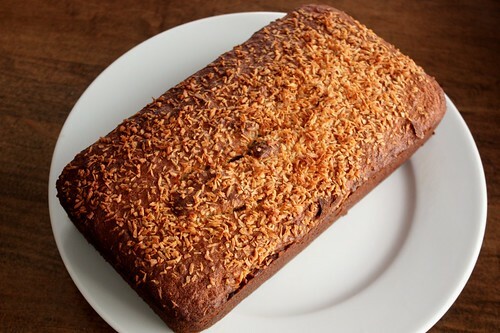 Pour into loaf pan and sprinkle with extra 1 tbsp of coconut flakes if you’d like. Bake for 45 to 55 minutes, or until golden brown. A toothpick inserted in the centre should come out clean. Allow bread to cool in the pan, on a cooling rack, for 10 minutes. Carefully remove from pan and allow to cool for another 20 minutes. Whisk together powdered sugar and lime juice, and pour glaze over bread. Allow to sit for 15 minutes before slicing to serve. 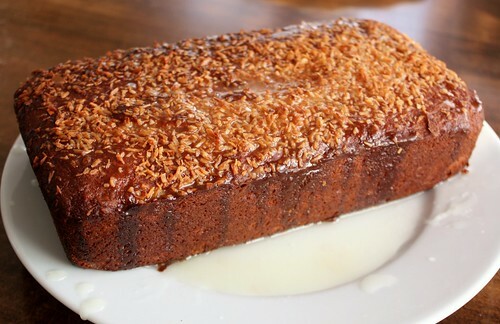 The glaze oozed it’s way into all the crevices of the coconut. I can already see that this banana bread is going to become a regular request in our house. The whole loaf was gone in no time. own quart of Gold Label Virgin Coconut Oil! 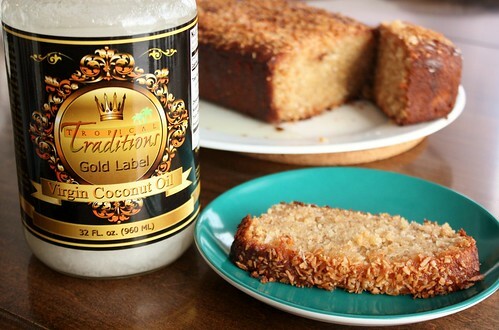 Tropical Traditions‘ Gold Label Virgin Coconut Oil is hand crafted in small batches by family producers, and it is the highest quality coconut oil they offer. 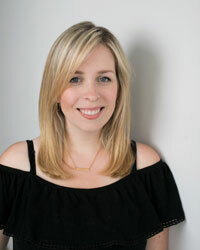 You can read more about how virgin coconut oil is different from other coconut oils on their website: What is Virgin Coconut Oil? I receive the newsletter. 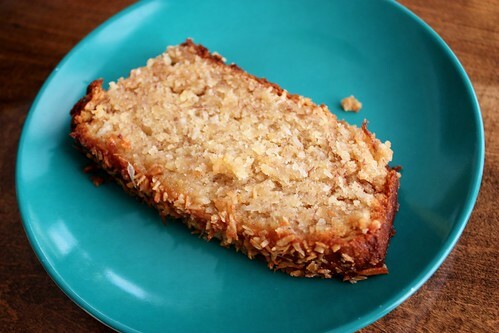 I’ve made a similar recipe from Cooking Light and substituted coconut oil. It was delicious! Thanks for sharing this recipe and I signed up for the newsletter. That banana bread looks so good! I am already signed up for the newsletter. Thanks for the giveaway and good luck to everyone. I signed up for the TT newsletter! I’ve already signed up for the TT newsletter. Registered for the TT newsletter. This bread looks so moist and good. Will definitely try this soon! I have to try that recipe! Looks delicious! I’m subscribed to the TT newsletter. I’m already subscribed to the Tropical Traditions newsletter, and would love to win this wonderful coconut oil. Thank you for this great recipe! I LOVE IT, THANKS AGAIN! I think I was already subscribed,but I did it again to be on the same side. Wow this recipe looks good! I tried to enter, hope it worked. I have signed up for the newsletter! Thanks for the giveaway! I LOVE IT, THANK YOU!HAVE A GREAT DAY! Already signed up for the Tropical Traditions newsletter.